Back in the spring, we put up several posts about Pulitzer Remix (here, here, here), the National Poetry Month project sponsored by the Found Poetry Review in which 85 poets “found” a poem for each day of April from a chosen book. Artist and poet Sheila Sondik selected The Yearling by Marjorie Kinnan Rawlings and from the novel created a dazzling series of poems. Egress Studio Press has now published the collection in a beautiful hand-sewn chapbook, Fishing a Familiar Pond, that also includes two of Sondik’s prints. 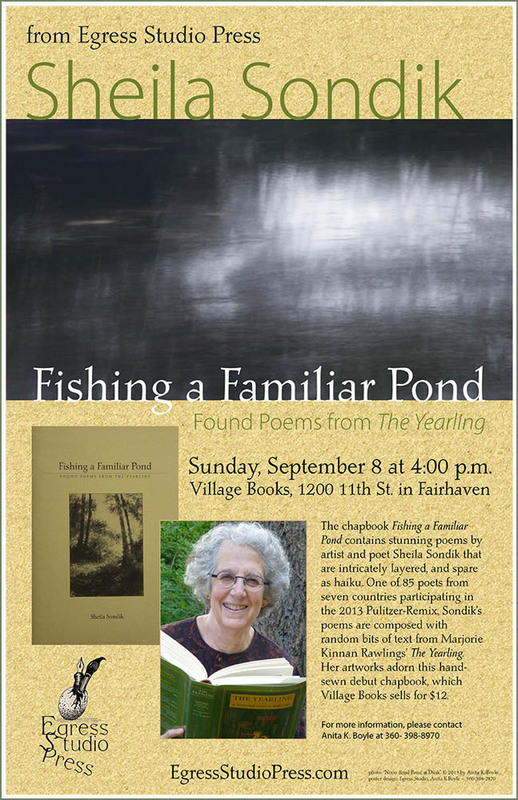 On Sunday, September 8, 2013, at 4:00pm, Sheila Sondik will introduce and read from her book at the Village Books Readings Gallery. Mark your calendar and don’t miss this reading! If you’ve been participating in the August Poetry Postcard Fest, in which each poem is a postcard-sized nugget, or if you tend toward short-form poetry, you might be interested in Sustaining Wonder. Carolyne Wright will teach this six-week class on Wednesday evenings at Richard Hugo House in Seattle with a focus on “longer narrative poems.” The class begins on October 30, 2013, and further details are on the Hugo House website. If you’re hungry for words, September promises to deliver. 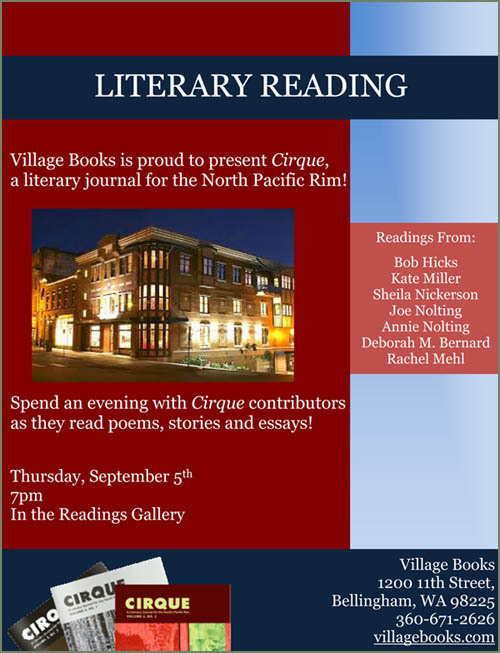 Thursday, September 5, 2013, brings together a number of voices from the literary journal Cirque for a reading at Village Books. The lineup includes Deborah Bernard, Bob Hicks, Rachel Mehl, Kate Miller, Sheila Nickerson, Anne Carse Nolting and Joe Nolting. (You may recognize some of these names as past Sue Boynton Poetry Contest winners.) The reading, in the Readings Gallery, is free and copies of Cirque will be available for purchase. To warm up for the Cirque reading, which starts at 7pm, you may want to attend the VB Writes…Poetry Writing Group, which welcomes drop-ins, is also free and starts at 5:30pm on the Village Books mezzanine. Watch this space for news of other worthwhile upcoming events, and also see the CALENDAR page, updated almost daily. And as long as we’re doing follow-up posts, here’s another. 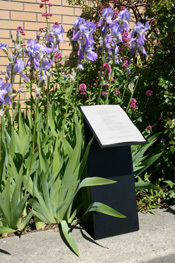 We have previously mentioned the Sidewalk Poetry Project in Northfield, Minnesota. This year, the project’s third, eight local poets had their poems selected from a field of 121 submissions and will have their poems added to the growing collection. More on the City of Northfield website. Daniel Patrick Helmstetter works with words, often unsticking them from their pages or pixels, turning them into signs, environments and (did we mention labor-intensive?) installations. For example, here’s a Design Work Life post about Danny’s Continental Cocktail Lounge. Here’s the murals and installations page on Helmstetter’s Tumblr. And here’s a link to a studio visit with the artist/poet. Wander around among his words. Escape from the early-winter doldrums to three days of creativity. Registration is now open for the sixth annual Northwest Writers’ Weekend, with three instructional classes (poetry, creative non-fiction and songwriting), readings/performances by instructors and participants, writers’ circles, time for writing on your own, six meals and lodging for two nights, all in a beautiful wooded setting with a lake and walking trails in Port Orchard, Washington. Find out more and register on the Northwest Writers’ Weekend website or like NWW on their brand-new Facebook page.